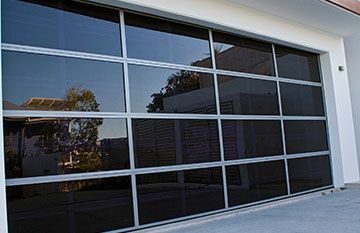 All Seasons Specialty Doors are receiving strong interest from Brisbane and Sunshine Coast customers requiring a premium folding or tilt door or window system that lifts up vertically to bring the outdoors in! 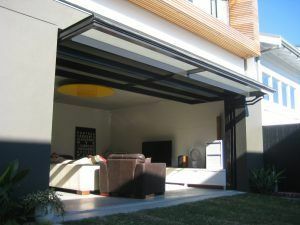 Glide-away tilt doors are perfect for blending indoor and outdoor living spaces! Look at how well this home achieves an unobstructed garden view from their living room with the Smartech vertical tilt door system in the fully open position. Finally there’s a design solution delivering maximum airflow and uninterrupted views… something that cannot be achieved with traditional sliding or bi-fold glass doors! With the system gliding in specially designed Smartech tracks either side of the opening, the counterweight balanced door delivers effortless and smooth operation. The Smartech Folding Door & Window system opens into a neat stack above the opening resulting in no loss of useable space or obstruction of pedestrian movement. 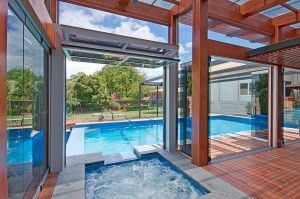 Look at the fantastic design solution achieved for this poolside spa! 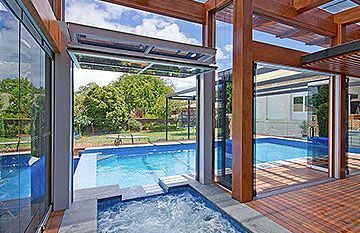 Now swimmers can easily move between the pool and spa area without any traditional stacking bi-fold doors in the way. And there’s no more worries about salt or chemical staining the glass with it neatly stacked up and out of reach from splashed water! 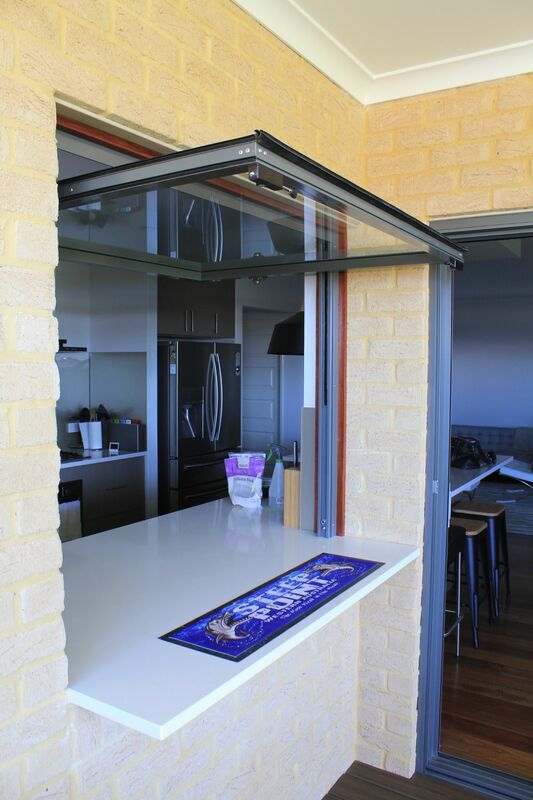 Now there is a seamless bar space – with no bi-fold doors stacked to the side limiting your usable bench space. 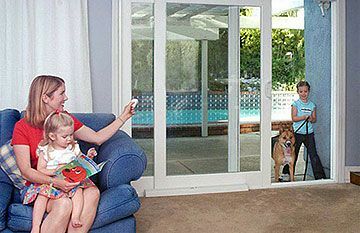 We LOVE this solution for our customer’s Queensland homes! Using Capral 50mm powder coated awning casement allowed Smartech to create this clever Kitchen Servery window. It’s very different to gas strut windows with a completely hidden system which also allows the window to open half in and half out. 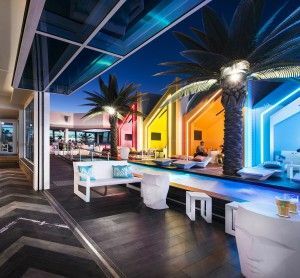 Smartech Systems are favourites with architects, designers and home DIY enthusiasts searching for a simple way to transform an outdoor pavilion into a comfortable indoor living space, when required. 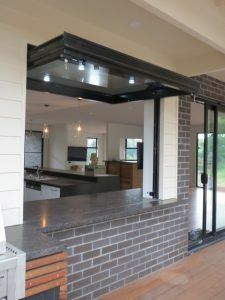 See the stunning commercial use of Smartech’s Glideaway folding window here… just imagine how a version on your outdoor pavilion could transform it into a space offering year-round comfort! 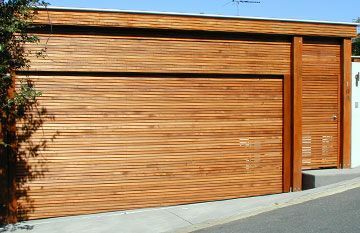 If you are considering a Smartech system – don’t forget the added benefit of not requiring a load bearing beam above the opening either… making closing in traditional Queenslanders and pole homes a much simpler task! For whisper-quiet automated operation with soft opening and closing, we recommend adding a motor to your Smartech Door or Window system. Visit the Kunda Park Showroom to try out the Smartech display model for yourself – or talk to the friendly All Seasons Specialty Doors team to learn more about the stunning Smartech door, wall and window systems. Offering maximum ventilation, using quality stainless steel components and aluminium powder coating available to match existing doors and windows, our Smartech range of vertical lift up folding and tilt doors & windows are ideal for the Sunshine Coast and Brisbane lifestyles.